Recognising Early settings that are fully committed to maintaining high standards of First Aid Training. 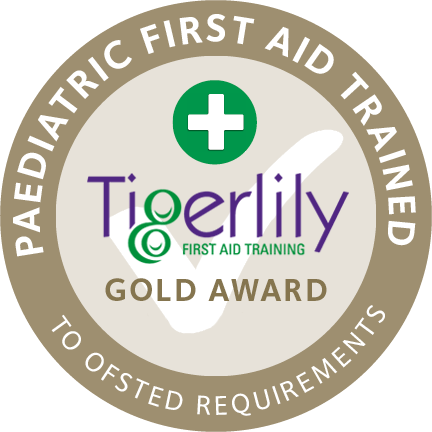 Tigerlily Training are a not for profit first aid training organisation who are monitored by the The First Aid Industry Body (FAIB). We have introduced an Accreditation Mark programme to recognise those Early settings that are fully committed to maintaining high standards of First Aid Training within their Nursery, School, College or Activity Centre. Settings receiving the Platinum Mark are committed to carrying out a minimum of one annual Paediatric First Aid Drill at their setting using the Tigerlily First Aid Drill pack. This simple drill enhances staff knowledge, enables staff to practice first aid emergencies and helps to identify potential training needs. Tigerlily Training only accredit settings that have committed to the above requirements in writing. Settings are monitored by Tigerlily Training and are responsible for advising Tigerlily via their on-line portal when a new member of staff starts employment. Tigerlily Training will also be made aware when a current member of staff’s first aid certificate is due to expire. Tigerlily Training may randomly audit client settings to help monitor compliance. The Tigerlily Accreditation Marks are a very positive move towards raising standards and Tigerlily Training are committed to working with our clients to achieve the highest standards of care. Tigerlily cannot be held responsible for any liability resulting from a setting displaying our accreditation but not holding the training levels required. We suggest that parents using childcare of any type ask to see evidence of first aid training certificates to satisfy themselves to the suitability of the childcare being provided.